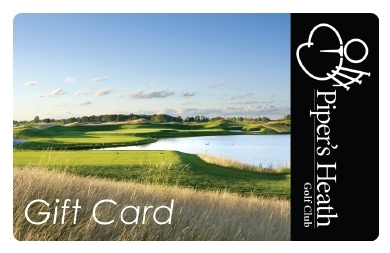 Piper’s Heath Gift Cards are the perfect gift for the golfer in your life! Gift Cards can be purchased from our Golf Shop or Online below. Please note: There will be a $1.00 Shipping and handling charge applied at checkout. Please click “Buy Now” for secure online purchases (payment requires Visa, MasterCard, AmEx, or PayPal Account). You can also change the quantities on the order screen at checkout.